A dumpyard in the outskirts of Coimbatore in Vellalore area which extends for over 400 acres, witnessed one of the largest fires recently. This blazing fire seemed to have spread to over 80 acres in which more then 10,000 tonnes of solid waste was reduced to ashes. 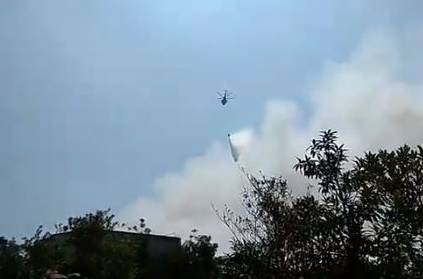 On helplessly looking at the fire spreading wildly, the Coimbatore Corporation asked help from the Indian Air Force (IAF) to combat the fire that broke out two days ago. According to the News Minute, after more than 30-hours of firefighting the fire was under control. Later in the day, a press release from the IAF station, Sulur, stated that they dispatched a helicopter (Mi-17 V5) to the spot based on a request from the state government. They had used bambi bucket to fight the fire where the chopper made 10 sorties by refilling water from the nearby Sulur tank. The aim of the helicopter was to prevent the fire from spreading before moving on to douse it. This page contains news relating to various facts and events. The views are generally about current affiars and general topics in diversified areas such as political, international, national, and regional issues, sports, health, travel, lifestyle, technology and business. People having similar interets on the above topics will find this page useful. IAF helicopter helps to fight Corporation dump yard fire in Vellalore | Tamil Nadu News.